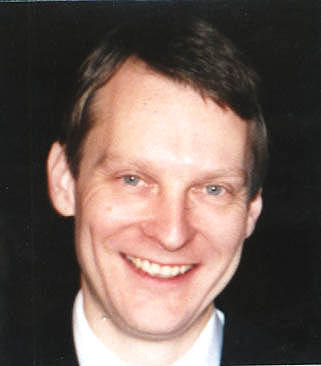 Stefan Heijtz is an internationally recognised specialist of the philately of the Falkland Islands, and is publisher and editor of the only specialised catalogue of the area "The Specialised Stamp Catalogue of the Falkland Islands and Dependencies", issued in its sixth edition in 2013. This specialisation has also made him a consultant for the expert committees of the Royal Philatelic Society (London), the British Philatelic Association (England), and the Philatelic Foundation (New York). He is also vice president of the Stockholm Philatelist Association as well as member of a large number of international philatelic societies. Stefan started to collect stamps at the age of four, and at an early stage became interested in stamps of the British Empire. At the age of 13, a larger collection of Falkland Islands stamps was bought at a local auction in Stockholm, and he started to communicate with the Postmaster of the Falkland Islands. 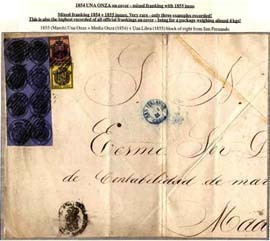 The collection grew and eventually it became the best postal history collection of the Falkland Islands ever formed. As such it was exhibited internationally many times, receiving a number of Gold Medals and even a Large Gold and International Grand Prix. Stefan has visited the Falkland Islands more than 20 times since 1989, and has worked within the Postal Administration of the islands as British Antarctic Territory Postal Officer during the seasons 1991-92 and 1992-93. 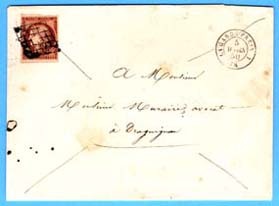 Stefan also collects Barbados, St Helena, Puerto Rico, Official Stamps of Spain, Faroe Islands, the Swedish South Polar Expedition 1901-1903, New York Postmaster Provisional 1845-1847, Registered Letter Stamps of Canada 1875-1893, Redirected mail to GB, La Garde Freinet Provence (France), Lethbridge Alberta (Canada), and Sweden the Three Crowns issue 1939-75, and many of these collections have been or will be exhibited. Stamps, Proofs and Varieties 1878-1937: This enormous 313 page collection was formed over more than 25 years, and it contained examples of virtually every stamp and variety, as well as examples of most proofs, known from the Falkland Islands. 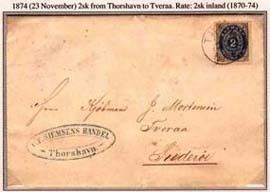 Although now broken down, at least one example of every stamp and printing has been transferred to the Reference collection (see below). PDFs of the entire original collection can be downloaded as follows: Queen Victoria 93 pages (size 6 MB), King Edward VII 27 pages (size 2 MB), King George V 1912-20 + 1921-28 68 pages (size 5 MB), War Stamps 65 pages (size 5 MB), Whale&Penguins + 1933 Centenary + 1935 Silver Jubilee 60 pages (size 5 MB). 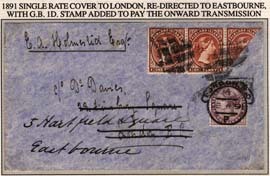 Postmarks 1869-1937: This large 121 page collection showed many examples of every postmark used in the Falkland Islands and Dependencies, including most varieties. 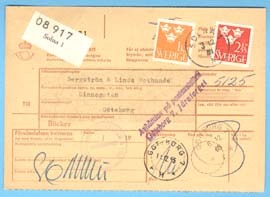 Although now broken down, at least one example of every postmark and postmark variety has been transferred to the Reference collection (see below). PDFs of the entire original collection can be downloaded as follows: Postmarks Stanley 47 pages (size 4 MB), Cork Obliterators 41 pages (size 3 MB), Other Postmarks (Ship cancellations, Fox Bay, New Island, South Georgia, South Shetlands) 33 pages (size 3 MB). 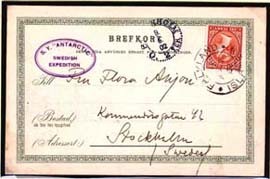 Postal History: Most of the huge collection of Falkland Islands and Dependencies Postal History 1827-1937, which was formed over more than 25 years, has been broken down and sold off. A book of this collection is planned and will be published in due course. Postal Rates 1840-1937: This 131 page exhibit was shown at one of the Falkland Islands Philatelic Study Group weekends. 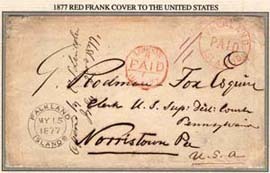 It is the most comprehensive display of the postal rates from this period ever assembled. A PDF of the entire exhibit can be downloaded HERE (size 11 MB). Reference collection: A ten volume collection containing every stamp issued in the Falkland Islands, the Dependencies and the British Antarctic Territory, as well as every postmark ever used in these areas. 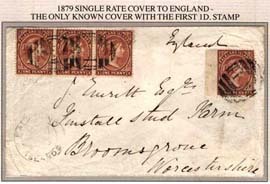 In addition, examples representing all the different sections listed under the Miscellaneous chapter in the Specialised F I Catalogue, in particular Postal Stationery and Fiscally used stamps. The stamps used for the Colour Guide on this website are from this Reference Collection. Forgeries and Fakes of Stamps, Surcharges and Postmarks: This 22 page display was shown at one of the Falkland Islands Philatelic Study Group weekends. It contains examples of many different types of forgeries, with genuine examples showed next to the forgeries. A useful reference. A PDF of the entire display can be downloaded HERE (size 6 MB). Fiscal use of Stamps: This 55 page display was shown at one of the Falkland Islands Philatelic Study Group weekends. 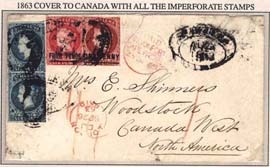 It shows many examples of Fiscal use of stamps, on and off documents, and other non-postal use of stamps and postal markings. A PDF of the entire display can be downloaded HERE (size 5 MB). South Georgia Glass Plates from the 1920's-30's: This 57 page display shows photographs taken by Theodor Andersson, mostly of Grytviken but also of some of the other whaling stations, and it shows interesting views of how life was in those days. A PDF of the entire display can be downloaded HERE (size 12 MB). The Falkland Islands National Stamp Collection: This collection now resides in the Falkland Islands Museum in Stanley. This display was shown at the handover ceremony at Falkland House in London, and it includes background details, and photos of the ten first pages of the collection. A PDF of the entire display can be downloaded HERE (size 5 MB). Spinkex 2007 - The Falkland Islands Philatelic Study Group display at Spink, London: This 43 frame (688 page) display was a joint effort by a large number of Study Group members, and it is the largest display of Falkland Islands stamps and Postal History ever shown. This record of the entire display was taken by camera, so therefore the quality is not always the highest. A PDF of the entire display can be downloaded HERE (size 13 MB). Postal History: An eight frame (128 sheets) exhibition collection which has been awarded Gold medals at International Stamp Exhibitions. 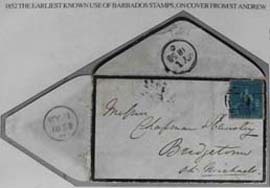 This is the best postal history collection of Barbados ever formed, and it contains a large number of rarities from the area. A PDF of the entire collection can be downloaded HERE (size 11 MB). Postal History: A ten frame (160 sheets) exhibition collection of the highest international standards which has been awarded Gold medals at International Stamp Exhibitions. This is the best postal history collection of St Helena ever formed, and it contains a large number of rarities from the area. A PDF of the entire collection can be downloaded HERE (size 19 MB). Postal History: An eight frame (128 sheets) exhibition collection of the highest international standards which has been awarded Gold medals at International Stamp Exhibitions. 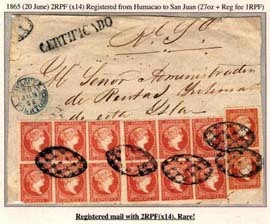 This is the best postal history collection of Puerto Rico currently in existance, and it contains a large number of rarities from the area. A PDF of the entire collection can be downloaded HERE (size 14 MB). A traditional collection: A six frame (96 sheets) exhibition collection of the highest international standards which has been awarded Large Vermeil medals at International Stamp Exhibitions. This is the best collection of the Official Stamps of Spain ever formed, and it contains a large number of rarities from the area. A PDF of the entire collection can be downloaded HERE (size 11 MB). Postal History: A nine frame (144 sheets) exhibition collection of the highest international standards which has been awarded Large Vermeil medals at International Stamp Exhibitions. It contains a large number of rarities from the area. A PDF of the entire collection can be downloaded HERE (size 17 MB). A remarkable 206 page collection of mail to and from expedition members, as well as documents and postcards related to the expedition. This is the largest and best collection of this expedition ever formed, and it contains a large number of rare expedition covers. A PDF of the entire collection can be downloaded HERE (size 17 MB). A traditional collection: A four frame (64 sheets) exhibition collection of high international standards, which contains a large number of rarities from the area. A PDF of the entire collection can be downloaded HERE (size 7 MB). A traditional collection: A five frame (80 sheets) exhibition collection of high international standards, which contains a large number of rarities from the area. A PDF of the entire collection can be downloaded HERE (size 10 MB). 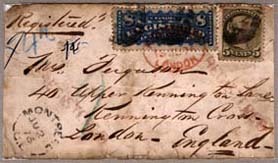 A collection of Queen Victoria period covers from anywhere in the world sent to Great Britain, forwarded within the GB with the addition of a British 1d. stamp, from 1d. Black onwards. This collection is currently being built. Between 1965 and 1980 my family had a house in this little village, and we spent most of our summer holidays there during this period. This collection has been formed as a memory of our time there and it contains covers and postmarks from the village between the early 19th century and 1980. Between 2002 and 2004, we had the pleasure of living in Lethbridge, Alberta, and this collection has been formed as a memory of our time there. 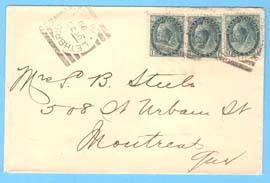 It contains covers and postmarks from Lethbridge, which opened its first Post Office in 1885. This remarkable issue consists of 34 different stamps with denominations between 50öre and 300öre, and it was in use between 1939 and 1975. 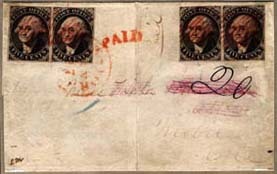 The collection contains postal history with stamps from this issue, and it shows a large number of different postal rates. This collection is currently being built and contains more than 500 covers and other postal documents with stamps from this issue.